China has intensified efforts to silence dissent in the run-up to a key Communist Party Congress next week, human rights groups say. The campaigners say the authorities have been arresting, abducting and intimidating activists to prevent them from staging protests. China has stepped up security ahead of the Beijing meeting. The congress will determine the direction the country takes for the next five years. 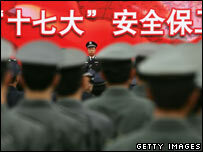 The 17th Communist Party congress is a major event in China. It will reveal how the power balance between rival factions is changing, who the country's future leaders are likely to be and what the party's policy priorities are for the coming years. The Chinese authorities do not want this showpiece occasion to be overshadowed by protests. According to campaigners, they have been making sure dissidents will not cause trouble. One group, China Human Rights Defenders, says two of the country's most prominent democracy activists - Yao Lifa and Lu Banglie - have gone missing. It says scores of others have been arrested or detained in their homes. New York-based Human Rights Watch says China has been working for months to restrict the movement of dissidents and tighten controls on the internet and the media, in order to impose a veneer of social harmony. Tight security is currently being put in place in Beijing in advance of the congress. Among the latest measures announced, the authorities have banned paragliders and model aeroplanes for the duration of the event, because of security concerns.